The World Trade Center is a complex of various buildings in Lower Manhattan, New York City, United States, replacing an earlier complex with the same name on the same site. The original World Trade Center was a complex of seven buildings. It featured landmark twin towers, which opened on April 4, 1973 and were destroyed in the September 11 attacks of 2001, along with 7 World Trade Center. The other buildings in the complex were damaged in the attacks, and their ruins were eventually demolished. The site is being rebuilt with five new skyscrapers and a memorial to the casualties of the attacks. 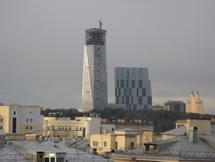 As of November 2011, only one skyscraper has been completed; the other four are expected to be completed before 2020. One World Trade Center will be the lead building for the new complex, reaching more than 100 stories at its completion. It became the tallest building in New York City on April 30, 2012, and is expected to be finished by 2013. A sixth tower is awaiting confirmation. The complex was designed in the early 1960s by Minoru Yamasaki and Associates of Troy, Michigan, and Emery Roth and Sons of New York. The twin 110-story towers used a tube-frame structural design. To gain approval for the project, the Port Authority of New York and New Jersey agreed to take over the Hudson & Manhattan Railroad, which became the Port Authority Trans-Hudson (PATH). Groundbreaking for the World Trade Center took place on August 5, 1966. The North Tower was completed in December 1972 and the South Tower was finished in July 1973. The construction project involved excavating a large amount of material, which was later used as landfill to build Battery Park City on the west side of Lower Manhattan. The cost for the construction was $400 million ($2,300,000,000 in 2013 dollars). The complex was located in the heart of New York City's downtown financial district and contained 13.4 million square feet (1.24 million m2) of office space. The idea of establishing a World Trade Center in New York City was first proposed in 1943. The New York State Legislature passed a bill authorizing New York Governor Thomas E. Dewey to begin developing plans for the project but the plans were put on hold in 1949. During the late 1940s and 1950s, economic growth in New York City was concentrated in Midtown Manhattan, while Lower Manhattan was left out. To help stimulate urban renewal, David Rockefeller suggested that the Port Authority build a World Trade Center in Lower Manhattan. Initial plans, made public in 1961, identified a site along the East River for the World Trade Center. As a bi-state agency, the Port Authority required approval for new projects from the governors of both New York and New Jersey. 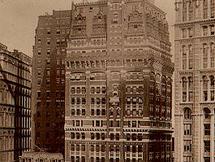 New Jersey Governor Robert B. Meyner objected to New York getting a $335 million project. Toward the end of 1961, negotiations with outgoing New Jersey Governor Meyner reached a stalemate. At the time, ridership on New Jersey's Hudson and Manhattan Railroad (H&M) had declined substantially from a high of 113 million riders in 1927 to 26 million in 1958 after new automobile tunnels and bridges had opened across the Hudson River. In a December 1961 meeting between Port Authority director Austin J. Tobin and newly elected New Jersey Governor Richard J. Hughes, the Port Authority offered to take over the Hudson & Manhattan Railroad to have it become the Port Authority Trans-Hudson (PATH). The Port Authority also decided to move the World Trade Center project to the Hudson Terminal building site on the west side of Lower Manhattan, a more convenient location for New Jersey commuters arriving via PATH. With the new location and Port Authority acquisition of the H&M Railroad, New Jersey, agreed to support the World Trade Center project. On September 20, 1962, the Port Authority announced the selection of Minoru Yamasaki as lead architect and Emery Roth & Sons as associate architects. Yamasaki devised the plan to incorporate twin towers; Yamasaki's original plan called for the towers to be 80 stories tall. To meet the Port Authority's requirement for 10,000,000 square feet (930,000 m2)) of office space, the buildings would each have to be 110 stories tall. A major limiting factor in building height is the issue of elevators; the taller the building, the more elevators are needed to service the building, requiring more space-consuming elevator banks. Yamasaki and the engineers decided to use a new system with two "sky lobbies"—floors where people could switch from a large-capacity express elevator to a local elevator that goes to each floor in a section. This allowed the design to stack local elevators within the same elevator shaft. Located on the 44th and 78th floors of each tower, the sky lobbies enabled the elevators to be used efficiently, increasing the amount of usable space on each floor from 62 to 75 percent by reducing the number of elevator shafts. Altogether, the World Trade Center had 95 express and local elevators. This system was inspired by the New York City Subway system whose lines include express stations where both express and local trains stop and local stations where only local trains stop. The structural engineering firm Worthington, Skilling, Helle & Jackson worked to implement Yamasaki's design, developing the tube-frame structural system used in the twin towers. The Port Authority's Engineering Department served as foundation engineers, Joseph R. Loring & Associates as electrical engineers, and Jaros, Baum & Bolles as mechanical engineers. Tishman Realty & Construction Company was the general contractor on the World Trade Center project. Guy F. Tozzoli, director of the World Trade Department at the Port Authority, and Rino M. Monti, the Port Authority's Chief Engineer, oversaw the project. As an interstate agency, the Port Authority was not subject to local laws and regulations of the City of New York including building codes. Nonetheless, the structural engineers of the World Trade Center ended up following draft versions of the new 1968 building codes. The tube-frame design, earlier introduced by Fazlur Khan, was a new approach that allowed more open floor plans than the traditional design that distributed columns throughout the interior to support building loads. The World Trade Center towers used high-strength, load-bearing perimeter steel columns called Vierendeel trusses that were spaced closely together to form a strong, rigid wall structure, supporting virtually all lateral loads such as wind loads, and sharing the gravity load with the core columns. The perimeter structure containing 59 columns per side was constructed with extensive use of prefabricated modular pieces each consisting of three columns, three stories tall, connected by spandrel plates. The spandrel plates were welded to the columns to create the modular pieces off-site at the fabrication shop. Adjacent modules were bolted together with the splices occurring at mid-span of the columns and spandrels. The spandrel plates were located at each floor, transmitting shear stress between columns, allowing them to work together in resisting lateral loads. The joints between modules were staggered vertically so the column splices between adjacent modules were not at the same floor. The tube frame design using steel core and perimeter columns protected with sprayed-on fire resistant material created a relatively lightweight structure that would sway more in response to the wind compared to traditional structures such as the Empire State Building that have thick, heavy masonry for fireproofing of steel structural elements. During the design process, wind tunnel tests were done to establish design wind pressures that the World Trade Center towers could be subjected to and structural response to those forces. Experiments also were done to evaluate how much sway occupants could comfortably tolerate, however, many subjects experienced dizziness and other ill effects. One of the chief engineers Leslie Robertson worked with Canadian engineer Alan G. Davenport to develop viscoelastic dampers to absorb some of the sway. These viscoelastic dampers, used throughout the structures at the joints between floor trusses and perimeter columns along with some other structural modifications, reduced the building sway to an acceptable level. The site of the World Trade Center was located on landfill with the bedrock located 65 feet (20 m) below. To construct the World Trade Center, it was necessary to build a "bathtub" with a slurry wall around the West Street side of the site, to keep water from the Hudson River out. The slurry method selected by Port Authority's chief engineer, John M. Kyle, Jr., involved digging a trench, and as excavation proceeded, filling the space with a "slurry" mixture composed of bentonite and water, which plugged holes and kept groundwater out. When the trench was dug out, a steel cage was inserted and concrete was poured in, forcing the "slurry" out. It took fourteen months for the slurry wall to be completed; it was necessary before excavation of material from the interior of the site could begin. The 1.2 million cubic yards (917,000 m3) of material excavated were used (along with other fill and dredge material) to expand the Manhattan shoreline across West Street to form Battery Park City.